From refreshed to way too fresh. Before commencing the Heysen Trail, I was advised by one experienced long-distance hiker to minimise, if possible, my number of rest days. Her suggestion seemed contrary to all of my other research. Your body needs to recover from the slog, right? However, on Day 34, I finally understood why she peddled this wisdom. After 24 hours relaxing in historical Burra, my mind struggled to remove my legs from their rediscovered comfort zone and out into the waiting storm. I watched the rain tumble down as I sat snugly inside the local bakery and munched down the last of my sprinkled doughnut. I wouldn’t normally enjoy such a toothsome treat at 9 in the morning, but my stomach needed pampering. I’d soon begin my longest stretch on the trail without a box drop or a sufficient resupply point. 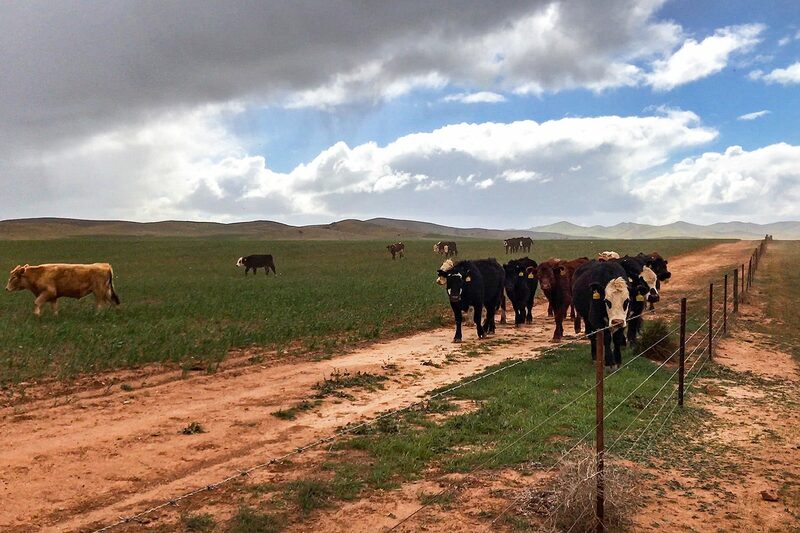 Seven days and 137.58 kilometres lay between Burra and the town of Kapunda. Plus, I’d already eaten a bowl of porridge, a Cornish pasty and salad sandwich for breakfast, so, this early indulgence was more like brunch. That’s what I kept telling myself anyway. I should have seen the weather coming. Every second day, since I arrived at Hallett Railway Station on Day 28, inclement conditions had beaten me from pillar to post. 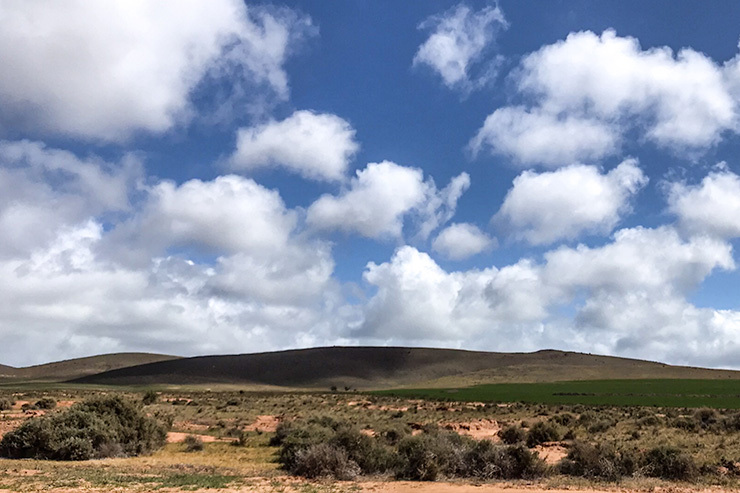 Fierce winds followed me into Caroona Creek Conservation Park, through the hills into Burra and now, on my journey back onto the trail on Day 34. Alas, I couldn’t sit here and eat delicious bakery goods all day (despite my stomach saying otherwise). My time was up. Rain, hail or shine, I had to move. Strong winds brought the rain as quickly as it dispersed it. Unfortunately, the terrain was as uninspiring as the weather. 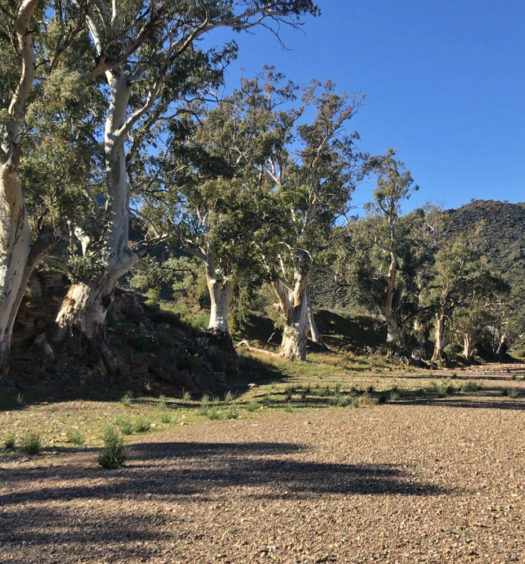 A macabre walk along the Goyder Highway was littered with roadkill, while every step along the accompanying cow-pat covered ‘Top Road’ was bleak. I felt like I had walked through some post-apocalyptic universe; somewhat fitting as the route led me toward ‘Worlds End Reserve’. 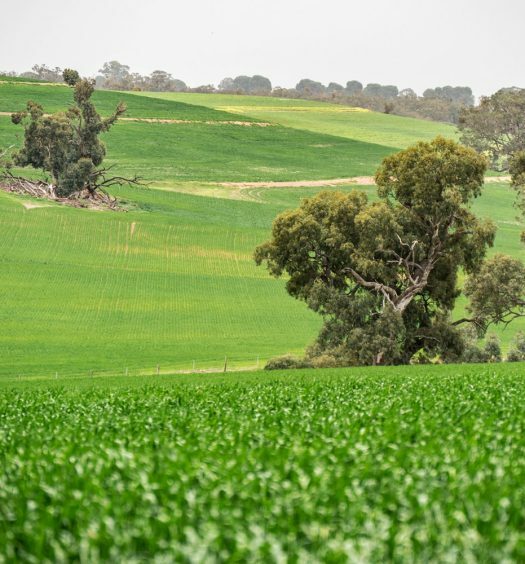 Worlds End Conservation proudly owns and conserves 1000 hectares of rare grasslands, woodlands and scrublands on two heritage listed properties in South Australia’s Mid-North. Despite the dismal conditions, I enjoyed my first walking company while on the trail. 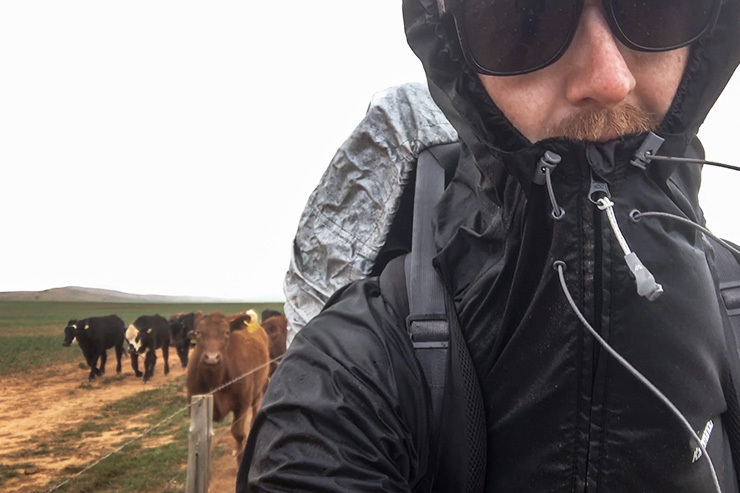 No, there wasn’t anybody as silly as me traipsing through this torrid weather – a hearty herd of cows accompanied me for several kilometres along the fence-lined stretch. After what seemed like an eternity slogging along the painfully straight track, I spied the Worlds End Hike-In Campsite in the distance. The sight of the Heysen Trail’s modest shelter complete with a small seat and rainwater tank seemed heavenly. The clouds had momentarily parted and a pink sun had begun to set. It seemed that I could finally enjoy a respite from the chaos. However, Day 34 threw up one last hurdle. The darkest, blackest, filthiest cloud of the day wafted overhead, drenching me one last time before I could set up my tent. An appropriate way to finish a miserable day. But, at least, if the current weather patterns had anything to go by, Day 35 should be a breeze. Easy on the legs, not on the eyes.